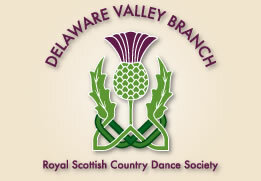 Welcome to the Delaware Valley Branch of the Royal Scottish Country Dance Society! Come dance with us at classes and events throughout the Delaware Valley area. Whether you are visiting from another branch or interested in trying Scottish country dancing for the first time, we look forward to seeing you. You don’t have to be Scottish to enjoy a lively style of dance and the toe-tapping, high-spirited Celtic music that accompanies it. The basics are easy to learn and before you know it you’ll be reeling and promenading about the room. 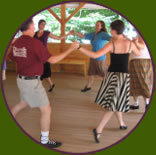 All are welcome at our regularly scheduled classes, ceilidhs, balls and social dances. Come on your own or bring a friend, the dance style mixes everyone around informally. Find a Class in your area on a weeknight convenient for you. If you’re a musician, check out our Music page and see how you can become involved. We welcome you to our dance community, whether you are new to dancing or experienced. We embrace people of any age, race, gender identity, sexual orientation, class, ability, language, or cultural background. Our dances are meant to feel fun, safe, and inclusive; if this isn’t true for you, please let an organizer know.